The Tesla Aspirator utilizes two advanced, state of the art positive displacement pumps. These dual headed pumps relieve back pressure to allow each individual pump to pull against the patient so that a deep vacuum is quickly reached and maintained. If one pump should go down, the other three will continue to function independently. The positive displacement pumps used in Tesla Aspirator are the quietest on the market. 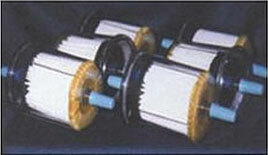 The aspirator is made even quieter with 1" shock mounts to eliminate vibration. This, combined with a super quiet muffler and insulation system, make the Tesla Aspirator the QUIETEST aspirator on the market today. All Tesla Aspirator come with a limited 5 year warranty on all parts and labor. 17" x 18" x 18"
The IP canister system features a reusable canister in combination with a disposable liner. 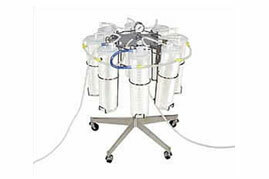 The liner is composed of a drainage receptacle and cap in a one-piece unit, thus eliminating leakage and the problem of caps coming loose during surgery. The IP is safer than other canister systems. After the procedure, the liner containing the aspirant is removed and disposed of... with NO HUMAN CONTACT. Multiple sizes of liners are available with a large port to facilitate the collection of solids if required. 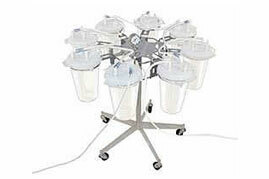 Standard lids contain a vacuum port, patient port, pour spout and internal filtered shut-off valve. Multiple canister sizes available.